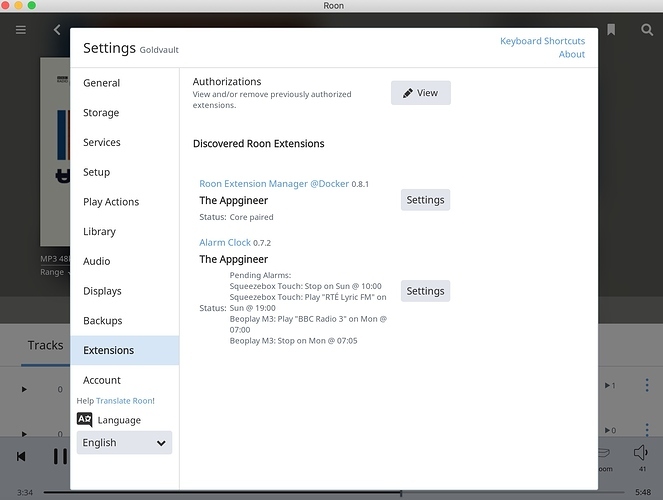 I have the Alarm Clock extension v 0.7.2 which has been working up until today. This morning the alarm did not happen. On investigation I find I cannot edit any of the alarms or add a new one. I have restarted the core and I have restarted the machine it is running on and I have restarted the remotes. You are running the extensions on a QNAP, right? 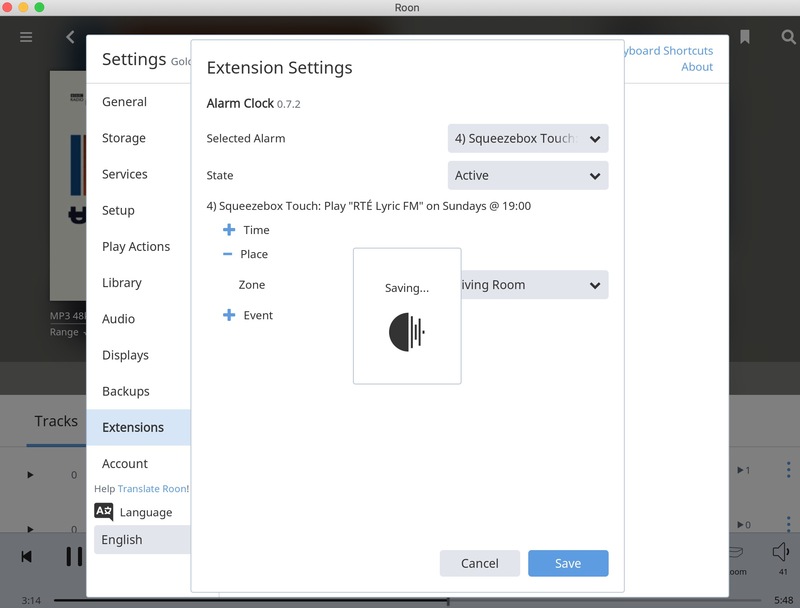 Does the Alarm Clock extension still appear in the extension overview in the Roon Settings? What happens when you press the Settings button? It might help if you can provide a screenshot. Yes, it is on a QNAP. I restarted everything, including the QNAP. So when you select Save you get the animated Roon icon and it never finishes. Can you cancel this by pressing outside the Settings dialog? I haven’t seen this before, so I’m guessing here, but it might be caused by corrupted settings or an invalid character in the settings. I initially thought that the special character in the station name (RTÉ Lyric FM) could be the cause, but I added it to one of my internet radio stations and I could not reproduce the problem. Let’s try to get our hands on the settings file. Can you get a command prompt on the container via Container Station or can you get ssh access to your QNAP? I can cancel this by clicking outside the Settings dialogue. You asked whether I could get a command prompt on the container. I did this and I renamed the config file. 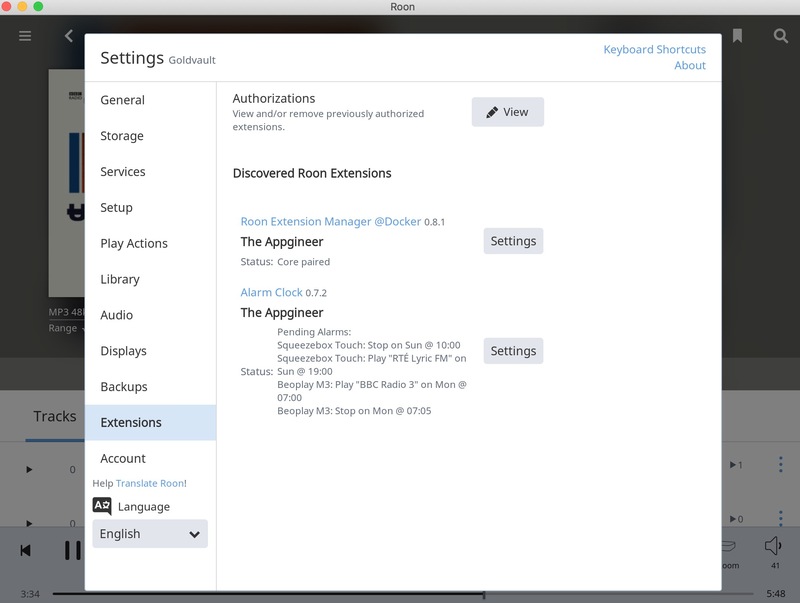 Then I opened the extension again and recreated the alarms, they saved and worked. One thing that immediately stands out is the profile name - I had just linked to my last.fm account which changed my Roon profile name. The old config file has my original profile name. Could this be the problem? The old config file has my original profile name. Could this be the problem? I manually changed the profile name in my configuration file and got the behavior that you described. With a non-existing profile name in the configuration there is a dash in the profile dropdown and if you select an existing one then you can save again. I will see if I can fix this in a future update.